We have made contacts with 3 communities of Kitchu, Tumuku and Nuhifor quarters in Belo subdivision to meet with single mothers and make plans for a meeting dates. This will be to get on the ground need assessments in all these communities to know what they needs are and what could be done. 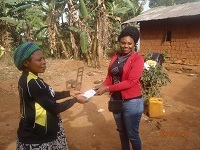 The single mothers of Nuhifor stood for micro-loans for the them to do their businesses while the other areas are still to decision what their needs with be.This microloan group has 2 new members who has done savings for the past 4 months and got their first loans today. Each of the 9 members went home with 50,000(about 92USD). They have small businesses as buying and reselling of palm oil, tailoring, hair dressing, buying and reselling of food stuff and and gardening vegetables.